Association Amici del Monumentale from Milan, Italy and Magá Global Arts Around the World will present on Sunday, 14th of May from 15:00 - 17:30 at Cimitero Monumentale di Milano (The Monumental Cemetery in Milan) the Requiem Monumentale by Yuval Avital, a world premiere touring event and an unique musical and perceptive experience. It will be performed in different stages at various locations in Milan. 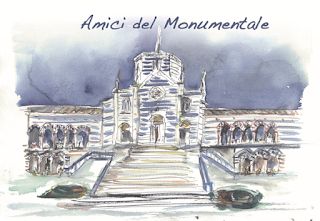 The work has been commissioned to Yuval Avital by the Amici del Monumentale to celebrate 150th anniversary of the Cemetery. The first stage takes place at the Monumentale, in the Famedio and along the Central Avenue. The work is under the aegis of the Municipality of Milan and Council of Lombardy, and has obtained the financial support of Fondazione Cariplo. It is a free event open to anybody who wishes to be absorbed by two original musical scores dedicated to two distinguished residents of the Monumentale: Alessandro Manzoni, the romantic novelist par excellence and Salvatore Quasimodo, winner of the Nobel Prize for Literature in 1959. The audience will be travelling an emotional route exploring opposite and complementary issues: life and death, transience and eternity, ancient and modern times. Inside the Famedio, a choir will perform a score written for 14 voices and conducted by Francesco Grigolo to pay a tribute to Salvatore Quasimodo’s “Ed è Subito Sera”. The voices will be accompanied by musical instruments of the Renaissance age. At the same time, a brass band of 100 element conducted by Gianmario Bonino, Maestro of the Giuseppe Verdi Conservatory will march along the Central Avenue performing “Manzoni Forest”, a tribute to Alessandro Manzoni’s richness of language and thought. Composer, multimedia artist and guitarist Yuval Avital is celebrated for his creations and installation performances in major festivals, art centers, industrial archeology sites, public spaces and performance venues. Born in Jerusalem, 1977, and now living in Milan, his works range from: huge sonic events for numerous performers to demanding orchestral and chamber compositions; from icon-sonic operas (combining classically-trained musicians and multi-media tools together with traditional performers of ancient cultures), to highly technological projects involving scientists, artificial intelligence and live sonic elaborations. His work includes sound installations, video and performance, often in collaboration with some the greatest artists, performers, directors and designers of our time. On this link you can view the original poster for the event. Additionally, in the morning, we will have a walk to celebrate Mum's Day "Di mamma ce n'è una sola" (there is only one mum) that in Italy falls on 14 May. Come and share the experience with us.